by Nicole Martins Ferreira is an informative read for all business owners, new and seasoned! Today and tomorrow you can get for FREE on Amazon.com for your Kindle device! 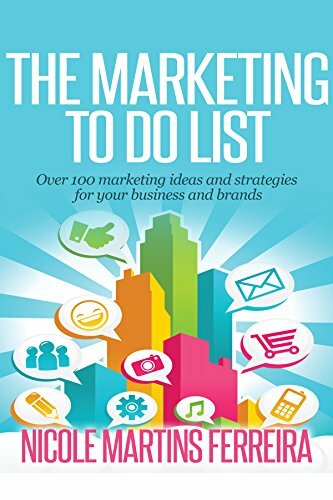 The Marketing To Do List helps entrepreneurs and new marketing professionals by providing a basic understanding of how to achieve success in marketing. There are over 100 marketing ideas and strategies to help business owners build a thriving business. Nicole Martins Ferreira has helped companies, all over the world, increase their online presence and increase their sales conversions. I know Nicole from working with her on a number of product reviews and giveaways when she was working in marketing for a Canadian company. She knows her stuff! In her new book, she explains over 100 ways businesses can successfully market their business. She’s worked in the field and has helped companies worldwide to increase their online presence and improve sales. The book starts with the basics and tells you where to start with your marketing efforts. Then she goes into the various ways you can market your business including Internet marketing, Offline marketing, Public Relations, Advertising, Trends and a list of resources useful to business owners. She even has information on how to partner with a blogger! She’s partnered with me in the past as well as many other bloggers and includes tips for how to best approach them, what you should look for and importantly, things you should NOT do! This section is a must-read. I’m passing this book onto my dad, who owns an insurance business. He hasn’t ventured into the online world and I need to show you him that he is missing out. I think Nicole’s book will give him a good start and at least, educate him on the other newer ways to promote his business. For me as a blogger, there were many items in the book that I didn’t know about and I mainly stick to the online world with marketing my blog. The book has sparked many ideas of things I want to check into and possibly pursue down the road. The book is straight-forward and easy to read. I like that she is honest and tells it like it is. If you are a business owner big or small, pick up this book. I believe in lifelong learning and am always looking for new resources to help improve my business. The Marketing To Do List is a must-read! Grab it while its free or if you miss the sale, pick it up on Amazon for the low price of $9.31. Connect with the author, Nicole M Ferreira on Twitter. Sounds like a very informative book. Thanks for the review. Will pass it on.